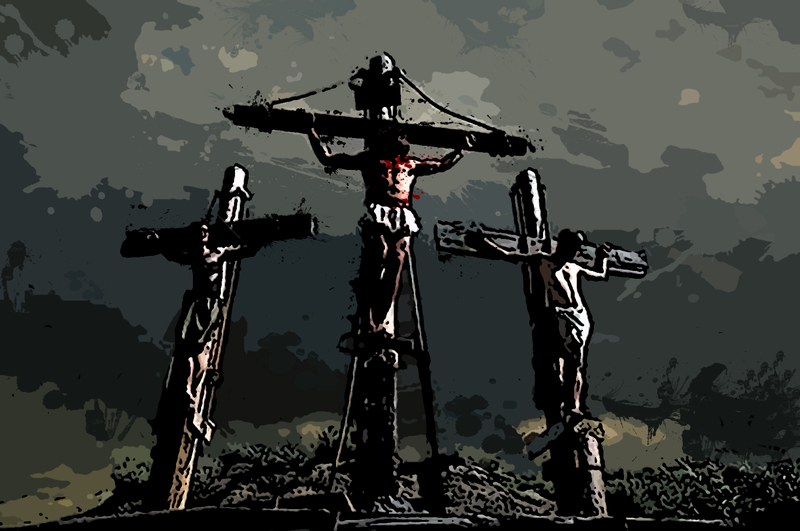 We will be reading the events that surround Christ’s crucifixion this Sunday. There is no way to cover that much text and subject matter and do a thorough job of exegesis…so suffice it to say that we will be looking at the major themes of what the cross means to us as followers of Christ. As I read it, all of the sacrifices, prophecies and narratives of the Old Testament lead in a line, converging at the cross of Christ. All of the effects and consequences of mankind’s great rebellion against God and His plan converge there as well. In the crucifixion of Jesus, we have pictured not only the judgment and pain of sin, but also the grace and forgiveness of God. It is a literal cross-hair on which the meaning of life is focused. As you read this account, you’ll see a wide variety of characters in Luke’s narrative. From mourners to soldiers to religious leaders to crooks. If you try any of these characters on for size, which ones can you relate to your own life and response to God? Which character’s interaction with Jesus upsets you? Which one comforts you, and why? As I think about what Jesus suffered in paying the price for my sins…I’ve been contemplating a right response to his love. His love is never in question…and I will never move from the torn curtain of God’s grace. But what should OUR response be to that love? Does our response reveal anything about what we believe and what we consider real? If I’m a rebel forgiven by great love, is further rebellion a reasonable reaction? I guess my question is, where’s the love? Guess I’m just thinking out loud. I love the challenge of which character I fit into? This is a very convicting post. Wish I was there Sunday to get the full-blown teaching! Wow, these thoughts along with last week’s message together make for a real “rubber meets the road” kind of message… Last week Jesus stood there quietly waiting, wondering what we will do in every situation we face with His Lordship over our lives….This week He hangs there hoping we will comprehend His amazing love and embrace Him in these same choices…I believe this is where the working out our own salvation with fear and trembling comes in…There is absolutely no better way to put it than “where is the love”? When I look back over my life as a Christian I still shutter at some of the past choices I’ve made, most of the worst one’s were after maybe just one too many drinks, judgement skewed, sin begets sin, etc. ..I am encouraged by the repentant thief on the cross but determined to embrace Him now and prove my love for Him today while I still have life before me. Very thought provoking post Rob…am I willing to surrender my “stuff” my hurts,habits,ego,pride ect. on a daily basis..in response to what He did for me on that cross? Can’t wait to hear your thoughts Sunday! “Where is the love?” That’s sort of the question of the ages isn’t it? Lot’s to read here. I don’t know about anyone else, but I have played most of these parts. Perhaps it’s my predilection for split personalities. I think most of us share too much in common with Humpty Dumpty. It is the cry of humanity, “we’re broken, can’t someone put the pieces back together.” I have been the religious dudes, demanding that you pledge allegiance to my brand of Christianity. I have been the thieves, questioning God and at the same moment begging for his deliverance. I have been the crowd, watching from a distance. Thinking I knew what was going on, only to see (too late) that things were not as the seemed. The only constant has been Jesus. What do you do with Jesus? I guess that’s the other question of the ages. To the end he is a redeemer, when doubted and mocked he forgives. Understanding that he was the only force in the universe that could actually put humankind back together, he became the bridge between the creator and his creation. At Skull Hill, in one final act of rebellion, humanity does its worst but God says, “you’re confused, you don’t know what you’re doing, I forgive you.” In the cross, we ask the question and get the answer. There is the love. We were paid for with a price. How come the payer of the bill has never presented me with a request for repayment? It is another of those upside down things that Jesus does. If I truthfully accept that Jesus died on the cross for me, is a request of repayment really required?